Unfortunately, it’s very common for journalists/traders to misrepresent the NY Fed’s Household Debt and Credit report because it has droves of interesting information. The most transparent way to misrepresent the data is to obsess about how much debt consumers have without contextualizing the results. Household debt to income is low compared to the last cycle because consumers deleveraged. The other aspect which is misrepresented is when one negative point is cherry picked out of an otherwise solid report. In Q4, household debt increased 0.2%, which is $32 billion, to $13.54 trillion. This is a new record as debt is $869 billion higher than the previous cycle peak in Q3 2008 and 21.4% higher than the trough in Q3 2013. Just because debt has increased doesn’t mean leverage has. 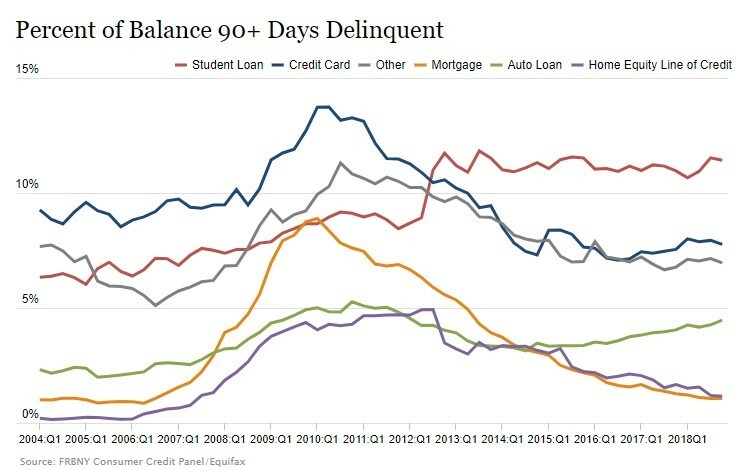 This cycle has been dominated by non-housing debt, namely student and auto loans. That makes sense because the housing bubble bust removed the excess in the market. The Q4 report continued this trend as housing debt fell from $9.56 trillion to $9.54 trillion and non-housing debt rose from $3.95 trillion to $4.01 trillion. The cherry-picked headline is that auto’s 90+ day delinquent loans increased from 4.3% to 4.5%. However, the other categories all fell or were the same. Aggregate delinquencies were steady at 4.7%. As you can see from the chart below, student loan delinquency rates continue to be elevated. The scary aspect is this is the delinquency rate in an economy with a strong labor market. Imagine how much it will increase during the next recession. It could surpass the cycle peak for credit cards in 2010 even if it’s a mild recession. The student loan delinquency rate fell from 11.5% to 11.4%. Credit card delinquencies peaked at 13.7% in 2010. Mortgage and HELOC delinquencies are very low. Consumers might be getting smarter about credit cards as the number of accounts closed has been increasing, albeit to a similar level in the previous cycle. The number of new accounts has been stable in the past few years and it’s also below the previous cycle. The number of credit card inquiries in the past 6 months fell to near the level it troughed at right after the last recession.